To harvest or collect rainwater from your house or shed roof, you must have your rainwater tank connected properly. There are several tricks to learn to ensure you filter your water correctly before it enters your tank. In this quick how-to article, I will explain how easy connecting a water tank is when you follow the right procedure and have the right tools. The ultimate goal is to make sure the water entering your tank is as clean as possible. Before you start, you must decide if you want a 'Dry' or 'Wet' delivery system. Both have their pros and cons. Click here to see which style of plumbing you want. Install tank and base - To complete this step correctly, jump to this article to learn how to prepare the right base. Pro tip: If your gutter is slightly lower at one end, I would suggest you put your connector there if it is not too far away from the tank. Hold the connector to your gutter and trace around it with a knife. Remove the connector and mark an 'X' inside your marked area. When your 'X' is distinct enough, punch the 'X' through your gutter with your knife. Using gloves, fold each cut-out triangle back until each point is facing the ground. Now you can slide your downspout connector over the folded metal gutter sections and screw it on from at least 2 sides. Connect a 90° elbow to your downspout connector that faces back towards the house. Run a pipe from this elbow to the side of your house. On that pipe, install another elbow that faces down the side of the house. Run a pipe down the side of your house until it is about 1 foot above the top of your tank. On this pipe, you can run 2 straps over it (top and bottom) that connect it to the side of the house. You can now add another elbow and run a pipe to the lid of your water storage tank. Next Step: Once your tank is in place and you have connected it to your roof, you must install an overflow to the top of your tank. This will direct the water in the right direction when the tank is full. To learn how to do this, jump to this article. Install tank - To complete this step correctly, jump to this article to learn how to prepare the right base. Make sure the top of the water storage tank is 1-2 feet lower than the gutter. This will ensure there is enough head pressure to get the water underground and back up into the tank. It will make a huge difference what size pipe you use too. The bigger the pipe, the less head pressure your will need. Using gloves, fold each triangle back until each point is facing the ground. Dig trenches - Now you know where your downspout will be, it's time to dig a trench from your downspout to your tank. Pro tip: Because this pipe is going underground, all joints must be properly jointed and supported with sewer grade pipe. Run a pipe down the side of your house until it is low enough in your trench. On this pipe, you can run 2 straps over it (top and bottom) that connect it to the side of the house. Now add another elbow at the bottom of this pipe facing the directing of the trench. After you run pipe from this elbow to your tank, it's time to direct pipe up the side of the tank and into the lid. Add a drain - Adding a drain at the end of your buried pipe is a good idea. This must be added at the lowest point to clean and drain the water in your pipe during extended dry periods. If your get below freezing temperatures, it is also important to drain the water out of your pipes to avoid cracks and ice buildup. If the water in your tank will be coming in contact with humans or animals, you must consider how you are going to keep the rainwater clean. By filtering the water as it runs off your roof and through your pipes, you can save yourself a lot of work. Here are 4 popular filters that will help with this process. Gutter mesh: This is installed on your gutters. It acts as a screen that stops all leaves and large debris entering your gutters. Downspout screens: These are installed on the downspout. They filter out and leaves coming from your gutters. First flush diverter: This is a must if your water will come in contact with humans. This filter flushes the dirty water that flows off your roof when it begins to rain. Tank screens: These screens are installed on the tank lid. This is your last chance to filter the water before it enters the tank. 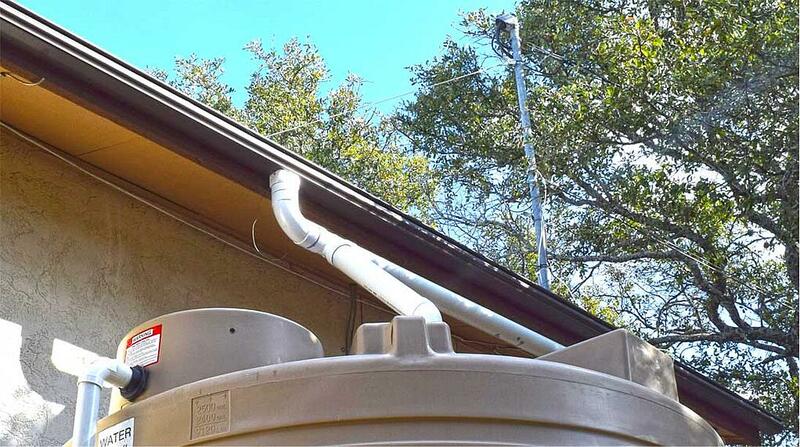 Now you know how to connect your rainwater tank to your roof, it's time to get to work. If you have any questions before, during or after you plumb your tank, comment below and we will be happy to help. If you are still unsure of the difference between 'wet' and 'dry' systems, re-read the article below to discover the pros and cons of each.